All trees are susceptible to salt injury. The extent of injury depends on the species of the plant. Conifers with more wax on the needles are less injured. Deciduous trees with resinous buds such as Horse Chestnut and Poplar or trees with submerged buds such as Black or Honey Locust are more resistant to injury. 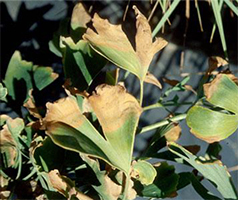 Sensitive plants exposed to salts usually show marginal and tip leaf scorch. 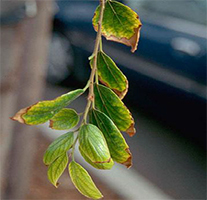 As severity increases, entire leaves are affected and may drop; buds fail to grow and dieback occurs. In extreme cases the plant dies. The first and most common symptom of salt injury is simply a slowing of plant growth that often goes unnoticed or is thought to be caused by something other than salinity. Reduced growth is usually accompanied by early fall colour and defoliation. Salts that affect plants may be present in the soil initially or may be added by irrigation water, fertilizers or salts applied to icy or dusty roads. De-icing salt (sodium chloride) can injure trees in several ways; direct contact of sodium chloride on the foliage from splashing and spray mist, and high levels of salt in the soil. High sodium levels in a plant can interfere with a number of metabolic processes including photosynthesis and protein synthesis. 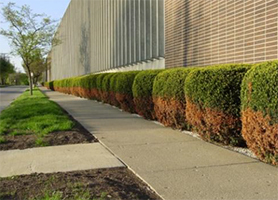 In areas with acute doses of de-icing salts, such as parking lots and sidewalks, plant may suffer osmotic stress, similar to ‘fertilizer’ burn. De-icing salts such as calcium chloride and calcium magnesium acetate (CMA) are more expensive than sodium chloride but much less damaging to plants. Protect susceptible plantings in high traffic areas with a screen of burlap-covered snow fence. Sodium is easily displaced from cation exchange sites in the soil. Applying gypsum or lime will supply other cations and speed the movement of sodium out of the soil. Irrigate over salted areas in early spring to leach salt below the roots. In salt prone areas, plant salt tolerant species and avoid salt sensitive species.